The response to works of both high art and popular art, and even to entertainment generally always will be to some extent subjective. Often, in the case of specific works or of specific artists, one approaches them with an abiding bias, favorable or unfavorable. It is with such a favorable bias that I approach any film created by Terrence Malick, long ago having fallen under the spell. Each of his four films prior to The Tree of Life: Badlands, Days of Heaven, The Thin Red Line and The New World, the only films released over nearly forty years of directing, has succeeded at leaving me mesmerized and infatuated. And Tree of Life is no different. The characteristics and the idiosyncrasies of previous Malick films that made them more likely to be dependent upon subjective response than most, are here as well: voice-over narration, a reliance on visual poetry, a languorous pace, an earnestness absent irony, bereft of the self-referential aspect so commonplace in art as well as popular entertainment now; and a meditative, contemplative tone. I’m not entirely uncomprehending of the objections of Malick’s naysayers. But I’m very glad I’m not among them. Availability to the work of this ambitious artist and to the pleasures of his meticulous and unique films is a gift I feel inestimably fortunate to have received. Malick’s films, this one especially, defy what even in some of America’s best films is an apparent sense of them as products, even if products of superior artistic quality. Beyond the works themselves, there is no doubt of course that even Malick’s films indeed are Hollywood products, if only on the basis of the reputations of the actors cast and the relative size of the budgets. But the experience of the film itself does not convey any of this commercial aspect, so typical and unavoidable in American films of every quality. In fact, they clearly defy it or elude it, and in the case of The Tree of Life, it simply isn’t present at all. It’s very difficult to describe The Tree of Life in language that doesn’t sound grandiose or pretentious, and I don’t expect to be able to do so. All one can say is that the film concerns itself with the nature of our time on Earth in the scope of the entire cosmos, a microcosm of life intertwined with the macrocosm, with most of the pertinent questions of meaning and morality and curiosity as part of the mix. The microcosm here is Waco, Texas in the mid-fifties, the coming of age of brothers, reflected upon by one of the brothers as a middle-aged man in New York City. On a visceral level, the film is visually and aurally staggering, and otherwise it is both emotionally penetrating and emotionally sweeping. Amazingly, in a film so unconventional, there is nothing whatsoever false in the rendering of family life, and one makes easy and strong identification with the universal and commonplace concerns and experiences of the characters. As much as Hollywood actors are always cast for their looks, here they also are chosen for the immediately acute and powerful expressiveness of the faces, particularly Sean Penn, and to an extraordinary extent Jessica Chastain, whose presence here is virtually a phenomenon in and of itself, and as much the center of the film as any one thing could be. Brad Pitt fully and convincingly embodies and humanizes the father here. Some reviewers have referenced both Kubrick’s 2001 and the films of Ingmar Bergman in describing the film, and there are certainly obvious similarities to the former, and some of the concerns of the latter. One can note similarities, broadly speaking to European art films, from directors like British filmmaker Derek Jarman to the Russian director Andrei Tarkovsky. 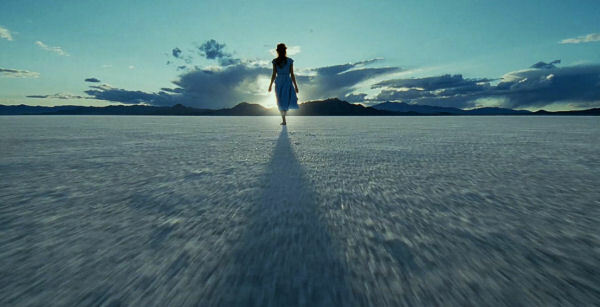 But this work, like Malick’s other films is both unique to Malick and uniquely American. I would say to any prospective viewer: this is not a film a viewer is required to work at, not a bit. It is a film, like Malick’s others, one will either emotionally and aesthetically and intellectually luxuriate in or one won’t. You’ll feel blessed, if for you, it turns out to be the former.